Ever wonder why we rarely catch a glimpse of the teeth of our founding fathers, or of anyone depicted in the art of that era? It was hardly customary to smile while snapping selfies in the 1700’s. That’s likely because artists could take up to a year to finish a portrait (imaging the cheek cramps holding a smile that long!). Plus, a face displaying 18th century dental work was nothing to immortalize on canvas. George Washington’s was no exception. He suffered poor dental health his entire adult life. He lost an average of one tooth a year for decades until, at his inauguration, he had but one tooth remaining. Throughout the years, including those spent fighting the British, General Washington regularly ordered dental appliances, tooth scrapers, and painkillers in his battle for oral health. But alas, the revolution’s greatest general was destined lose the war to save his smile. 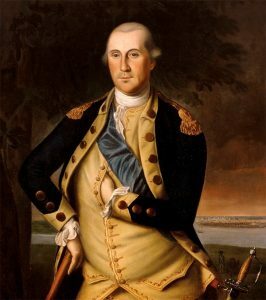 Paintings of young Washington illustrate a handsome man with a natural and well-proportioned facial bone structure. 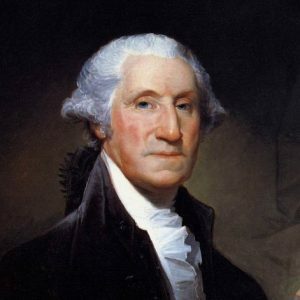 Images painted during his Presidential years, however, disclose the underlying dental turmoil Washington was enduring. If loosing his teeth was not painful enough, the devices built to replace them were almost worse. The term dental appliance today describes several types of elegantly crafted, perfectly fitted devices that fill voids, realign bites, and restore smiles. In 1776, however, the contraptions George suffered were more the size, weight, and complexity of an actual household appliance. 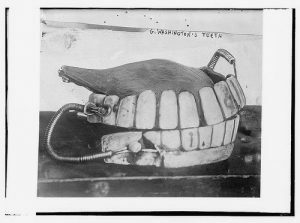 By the time Washington became our nation’s first President, his dentures were a heavy construction of lead, springs and gold wires, holding together teeth fashioned from bone and ivory, along with real teeth taken from cows, asses, and even slaves (to whom he paid the customary fees for “donated” teeth). Not only were these teeth somewhat difficult to look upon, their heavy springs required Washington to clinch his jaw in order to close his mouth. So, not only did the heavy dentures cause is lips to protrude, over time they also caused his jaw to become heavy and misshapen. The face we have come to revere as that of the “Father of our Country” was shaped, in part, by the painful personal battle so few knew he was fighting. As one might understand, these dental problems made President Washington self-conscious and reticent to speak in public; Imagine the great speeches never delivered because of the extraordinary effort required for him to even talk. Contrary to folklore, no evidence affirms that Washington ever gave orders or made speeches through teeth carved from wood. This myth likely started because Washington enjoyed a glass of wine at dinner and, over the years, the red wine stained the cracks in his ivory teeth, creating patterns that resembled wood grain. These two centuries later, the art of restoring dental health brings confidence and comfort to millions. From simple cosmetic procedures that enhance smiles, to full restorations of entire sets of teeth, Harris Dental is helping patients live life to the fullest with excellent oral health. If ever you find yourself shy to smile in a selfy, or reticent to speak in public because of dental concerns, please let us help. Don’t rob yourself and those you love of the joy of sharing smiles with you. with a regularly priced New Patient Exam Call 480-428-0040 today to schedule. Harris Dental is known throughout the Phoenix metropolitan area for quality and compassionate dental care. They offer comprehensive dental services from general dentistry to cosmetic dentistry and dental implants. They even provide sedation dentistry for those with dental phobia. They are now excited to offer virtual smile consultations so patients know what to expect even before coming into the office. Patients come from around the nation and most particularly from communities in the Valley of the Sun including Phoenix, Mesa, Scottsdale, Chandler, Gilbert and Tempe, Arizona and zip codes 85016, 85018, 85251 and 85253.